Date & Time: Sunday, November 4, 2018 at 10:00 AM. NEW FOR 2017: Chip timing and everyone starts at 10:00AM. Fees: Pre-registration (postmarked on or before 10/31/18), $30.00. 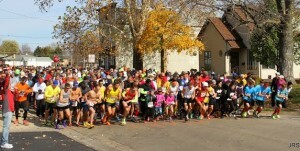 Registration after November 1st, including race day, $35.00. A $2.00 discount for per-registered members of Starved Rock Runners, Lake Run Club, Illinois Valley Striders, Springfield Road Runners Club. Course: Point to point. Featuring a downhill slope for the first .75 mile stretch. Runners will then enter the I-M Canal Towpath and run the next approx. 4.2 miles on a flat, unpaved surface (crushed limestone). Race finishes on a paved street near the elementary school in Utica, IL. Split times at each mile along the course. 2 water stations will be available with ambulance crews covering the entire course. Race Circuit: The Canal Connection is part of the race circuits of: Starved Rock Runners, Lake Run Club, Illinois Valley Striders, Springfield Road Runners Club. Race Day Registration: Registration & packet pick-up at Elementary School in Utica, IL from 8am to 10am the day of race. All runners must register/check-in at School in Utica. School is located at 248 W. Canal Street, Utica, IL. Transportation to start: Buses will begin to leave Utica at 8:30am to transport runners to the starting line in LaSalle, IL near the west end of the I-M Canal Towpath. Gear Check: A bag will be provided with your race packet in which you may secure your possessions for transportation back to the finish line. Gear will be checked according to bib number & available for pick up at the School in Utica. Please make sure your bib number is written on the outside of the bag. Starved Rock Runners, Ltd. is not responsible for any lost or stolen items. Please don’t check anything of value. Shirts: Newly designed Sweat Shirts to all paid entrants. Awards: Presented to top everall male and female, top overall male and female masters and top 4 winners in the following age groups: 14 & under, 15-19, 20-24, 25-29. 30-34, 35-39, 40-44, 45-49, 50-59, 60-64, 65-70, 71-74, 75 & over.